The flexibility of money, as with so many of its qualities, is most clearly and emphatically expressed in the stock exchange, in which the money economy is crystallized as an independent structure just as political organisation is crystallized in the state. The fluctuations on exchange prices frequently indicate subjective-psychological motivations, which, in their crudeness and independent movements, are totally out of proportion in relation to objective factors. Georg Simmel. The Philosophy of Money. 1900/1979. There are many reasons, both sociological and technical, why capital markets are an interesting application–domain for sonification. Sociologically, they have become a powerful, some might say almost religious, contemporary force, even as their overtly emotional expressive open-outcry marketplaces have become, or are quickly becoming, virtualised gatherings of disembodied screen traders. Sonification of the activities of these markets thus functions as a form of re-embodiment. While such sociological considerations are interesting, the studies reported here are more pragmatic and descriptive. Despite intensive study, a comprehensive understanding of the structure of capital markets exchange trading data remains elusive. For an overview of this issue, see Chapter 5 of Sonification and Information, including more detail of the techniques illustrated here, or just read a brief overview of market data. The power of visual representation to enhance and deepen the understanding of phenomena and their abstractions is undisputed. Yet, as with many time-domain processes, visual representation does not always reveal the structure of the data. In The (mis)Behavour of the Markets Benoit Mandelbrot emphasises the difficulty, even impossibility, of distinguishing the difference between real market data and computer-generated Brownian motion using graphs. This leads to a sonification question: Are there ways of presenting trading data that enable its structural characteristics to be perceived aurally? To explore that question, we sonify the XAO, an Australian market index, along with a computer-generated statistical analogue of it for comparison. The dataset chosen is twenty-two years (21April 1986 to 18 April 2008) of the daily closing price of All Ordinaries Index (ticker XAO) of the Australian Securities Exchange (ASX). The XAO is the broad Australian market indicator, a composite of the 500 largest companies, weighted by capitalisation, which are listed on the exchange. Figure 1 is a graphical representation of this datset. Figure 1. 22 years of daily closing prices of the ASX-XAO. 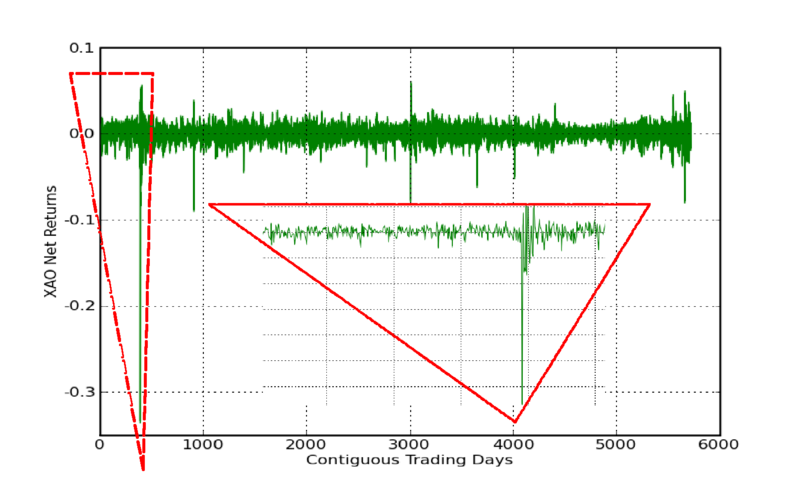 As the value of XAO increase roughly exponentially over time, the technique chosen here is to convert the dataset in to a series of net-returns, or ratios of successive value differences. For an asset whose price changed from p(t) at time t to p(t+dt) at time t+dt, the linear net returns Rnet are defined as (p(t+dt) - p(t))/p(t). Figure 2 is a graphical representation of these net returns. The insert is an amplification of the dotted sesction containing a very negative return–that of 20 October 1987 (“Black Tuesday"), the largest one-day percentage decline in stock market history. Figure 2. Graph of the Net Returns of the XAO dataset. In the following audio example, the modulation rate is 8 Hz (i.e. 8 tones per second), the centre frequency is 300Hz and the frequency range is three octaves. The "Black Tuesday" return has been reduced to the next lowest level (near the left-hand corner of the insert triange) in order to more effctively use the pitch range. Larger changes in pitch indicate larger changes, i.e. higher volatility, in $value. NB: If you don't want to download the whole file and that of the other 3 examples, you can download a single file of 20 second snippets of all 4 examples (1.4Mb MP3 file - see the Summary at the bottom of this page). This is the third snippet. 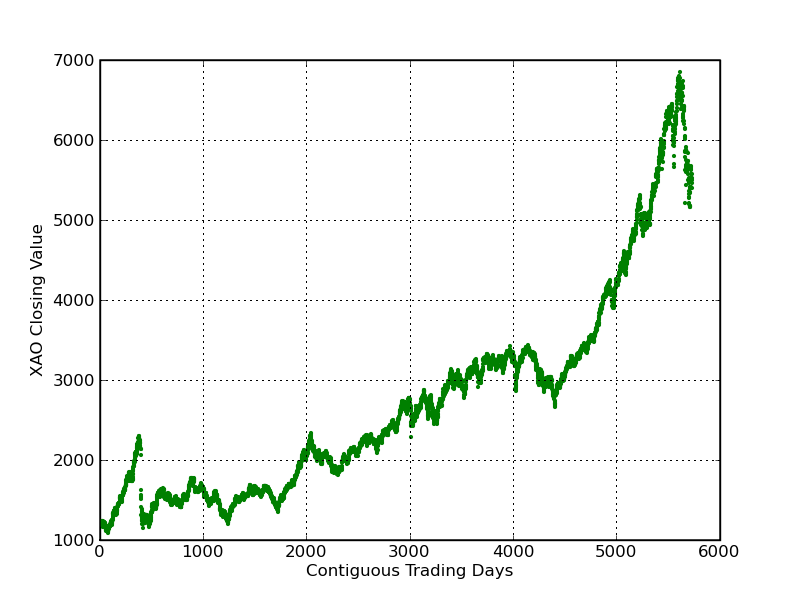 Can real trading data be distinguished from a stochastic simulation of it? Notice the overwhelming preponderance of small pitch changes (small changes in net returns) with occasional periods of greater volatility. This is even clearer when we compare it to a couple of standard distributions: uniform random, and Gaussian. NB: If you don't want to download the whole file and that of the other 3 examples, you can download a single file of 20 second snippets of all 4 examples (1.4Mb MP3 file - see the Summary at the bottom of this page). This is the first snippet. In a Gaussian, "normal" or bell-shaped random distribution, the net returns with the greatest frequency are centred round the mean and those furthest away from the mean occur less often. In this manner, normally-distributed returns are more statistically similar to market returns than uniformly random returns. In fact classical quantitative theory (after Bachelier) proposes that they are identical. Here is a sonification of a set of normally distributed random returns, with the same mean and standard deviation as the original set of market returns. NB: If you don't want to download the whole file and that of the other 3 examples, you can download a single file of 20 second snippets of all 4 examples (1.4Mb MP3 file - see the Summary at the bottom of this page). This is the second snippet. Figure 3 is an overlay of histograms of a normal distribution with that of the returns dataset. It clearly illustrates that the returns are not normally distributed: more returns are bunched around the mean and in the tails of the market net returns distribution than in a normal distribution. As a final comparison, a sonification of a statistically identical but decorrelated dataset to the net returns is presented. While they both appear to have short trending auto-correlative sequences, those of the net returns appear more consistently and when they do they appear to last for longer periods of time. Figure 3. 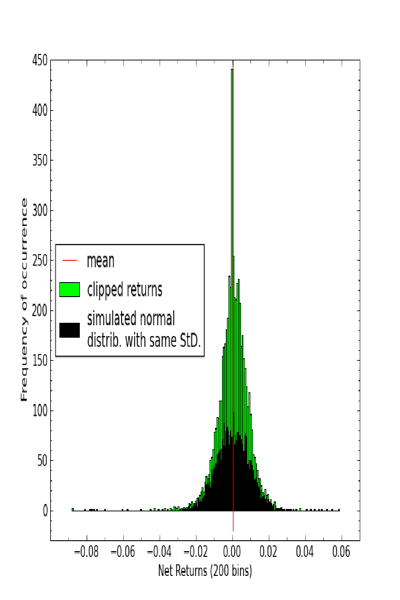 A overlay of a histogram of the clipped net returns (green), with a histogram of a simulated normal distribution with the same mean, standard deviation and number of datum (black). As a summary, here is 4 snippets of sonifications of the four datasets presented in this overview. A. Uniformly distributed random data. B. Normally distributed random data. C. XAO Net Returns data. D. Decorrelated XAO Net Returns data.